Readers continue to share details in their receiving telephone polls on this beautiful summer Saturday. It's July and four major campaigns are out vying for your vote come November. Some readers say it's the shinny penny, Councilman Mike DeFusco running another poll. (His earlier version was a push poll.) This one has some choice questions on Freeholder Anthony "Stick" Romano but is a tamer version than the last. Ryan Yacco, the campaign manager for Councilman Mike DeFusco is running a poll for his candidate in Hoboken this weekend according to some reader responses. 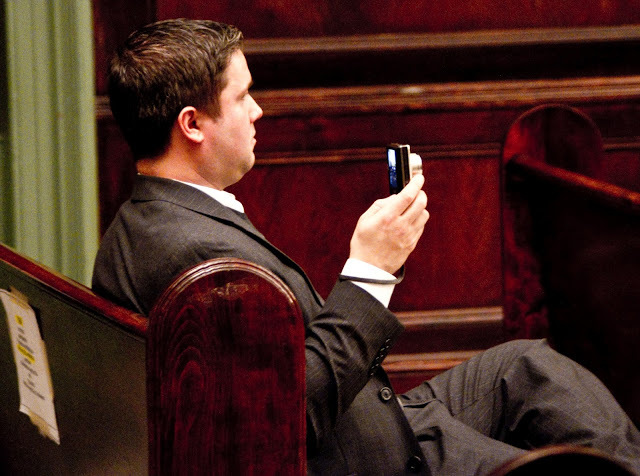 Here he is back in the day recording a public speaker circa 2011 when he worked for former councilwoman Beth Mason. Some think she ran a poll last weekend. Hoboken is already polled out. Councilman Ravi Bhalla apparently has a push poll out with an anti-Trump and anti-Big Tent Reform message trying to damn his opposition, Council President Jen Giattino as a suspect Trump voter. Her campaign calls this untrue and says it's not an unanticipated low blow from her friend Ravi Bhalla. Hey, giant ambition is at stake. The Ravi Bhalla push poll appeal confirms what some suspected coming: Republicans, Independents, Libertarians, etc. are second class citizens and need not apply. They are like the City Council President, all outcasts, no matter their contribution to the Reform Movement, Hoboken or as in the case of Giattino, a sparkling six year record on the non-partisan City Council. Talking Ed Note: Does anyone in the Mayor's office and the Bhalla for mayor campaign care to name which executive of the federal government must sign off on the $230 million Rebuild by Design flood prevention plan? Think about it; we'll wait until you find a clue.